Miss Lily’s is what would happen if Major Lazer made a restaurant. That’s a pretty specific music reference, but it’s also pretty damn perfect. A Jamaican restaurant, Miss Lily’s is modeled after the West Indian eateries in Brooklyn and The Bronx and is owned by the dude from La Esquina and a few nightclub kingpins. The result of that combination is a very sceney place where good looking people can go eat spicy Caribbean food and stare at each other. But despite that being the case, we couldn’t help but be impressed with how well the concept is executed - and how tasty the food is. Most everything we tried landed somewhere between good and great, and the aesthetic of the restaurant is one of the smartest we’ve seen in this town. 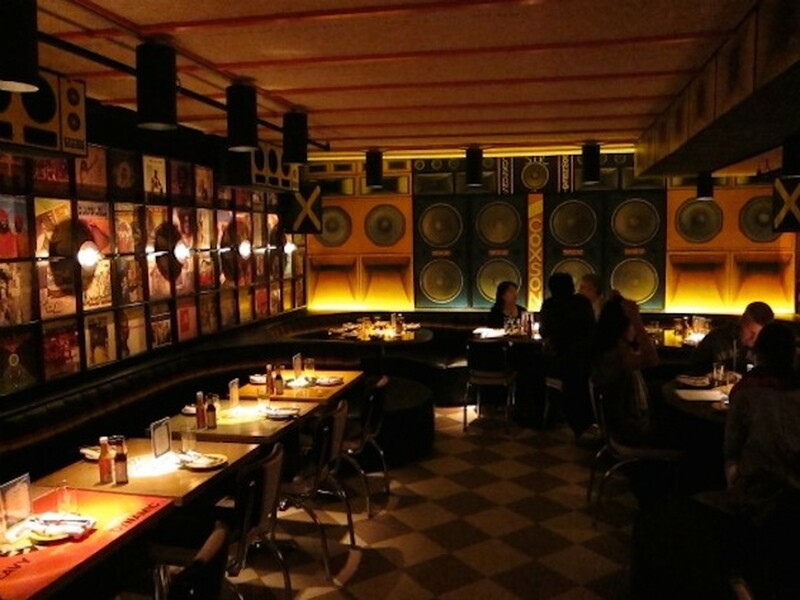 The front bar area is an excellent facsimile of a jerk chicken take-out counter, and the vibey back room is papered with old ska and reggae album covers, much like my living room might be if I smoked more weed. And even though it tends to be a little hot and sweaty, this is an undeniably cool place to hang out. Just don’t expect it to be your go-to spot for jerk chicken on the cheap. Miss Lily’s is ultimately most Perfect For impressing those who like to see-and-be-seen and don’t mind paying for it. Think elote from Cafe Habana or La Esquina, but Caribbean-style. There is some toasted coconut on there, and it is awesome. A nice and delicate ceviche with big hunks of red snapper. Our only complaint here is that the plantain chips this comes with do you no service other than to litter your ceviche with broken chip fragments. We’ll use our forks, thanks. Ackee is a fruit from Jamaica, and this dip was a white starchy substance that was also very garlicky. We liked it, but probably wouldn’t order it again. Been there done that. Three little tacos in a red basket with a pretty piece of lobster in each. These were delicious. Another successful round of tacos, these ones were spicy and tasty, though the ackee has a texture that might turn some people off. Not us. This whole red snapper has an incredibly tasty Caribbean spiced skin and is something that one of you at the table needs to order. You’ll have to work around some bones, but it’s worth it. So good. More flavorful than we might have expected, we loved this... especially the okra. This dish had a nice level of spice to it but wasn’t too intense. The Islands is a tiny, casual Jamaican restaurant in Prospect Heights.